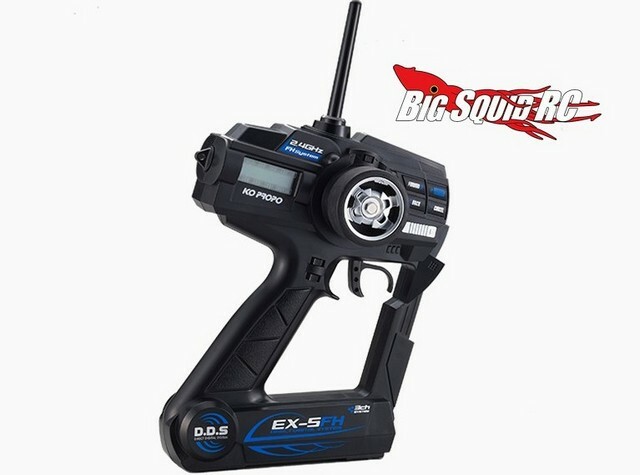 KO Propo EX-5FH Radio System « Big Squid RC – RC Car and Truck News, Reviews, Videos, and More! The folks over at KO Propo have announced their latest radio system, the EX-5FH. The EX-5FH features their DDS Direct Digital System which helps make it one of the fastest radios on the market. The new radio is also set up to be used with KO receivers that have an internal gyro (like the KR-212FHG). The EX-5FH allows gyro adjustments from the transmitter while driving and makes it one of the latest radio systems to incorporate electronic stability control. The EX-5FH is shipping now and the unit that includes the transmitter, gyro receiver, and a servo has a part number of #10602. Expect a street price of under $200 and for more details hit up This Link on the official KO Propo website. Want more KO news? Find it Right Here on BigSquidRC.